If you want to buy a frugal engineered car, go for Japanese vehicles, or if you want performance vehicles go for European cars. 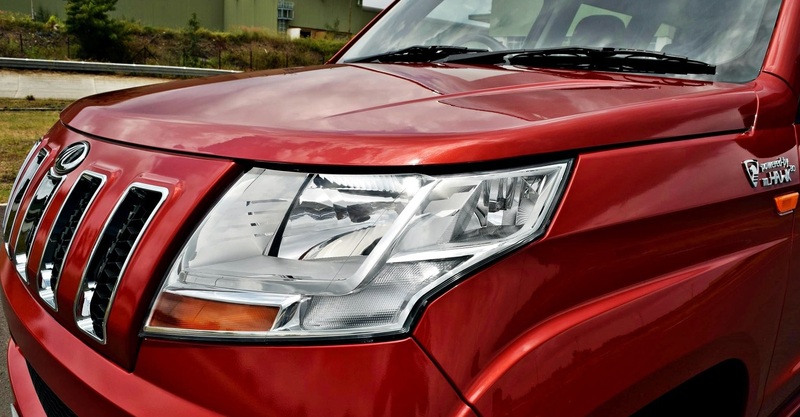 If you want to buy a Sports Utility Vehicle (SUV) go for Mahindra vehicles. The SUV specialist has wide range of SUVs including XUV500, Scorpio, Bolero and Quanto which sell in large numbers in India. But later the number came down as the competition started picking up for the SUVs. 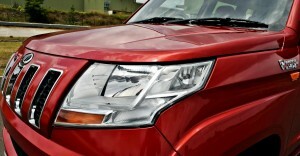 Earlier it is set that Mahindra vehicles are tough and rugged and lack in quality and features. But the competition has forced the home-grown auto major to look at the quality levels. As a first step, the refinement came when they launched the XUV500. 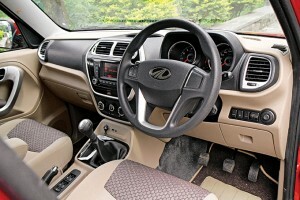 The premium SUV came with lot of features, better interiors coupled with Mahindra’s own style of drive and handling. For Mahindra the DNA lies in building SUVs and as a result of it, the company has added one more to its kitty, the TUV 300. The TUV300, the new compact SUV has the space to seat 7, and with its RWD configuration, and 184mm of ground clearance, it has got the real ability to go off the road and even in the tough roads. The main USP of the TUV300 is that it is not derived from an MPV, nor is it a monocoque crossover. It has been engineered from the plain sheet to be tough as it sits on the ladder-frame construction. The look of the vehicle is inspired from the ‘battle tank’ which has sharp edges and boxy look. In the front, the grills look similar to that in Jeep, but looks different due to the 5 vertical slits in the radiator grill, bolder bumper that carries huge air dam and bolder fog lamps. The headlamp assembly is well integrated with the grill where the main illumination unit with static bending feature gets a square shape, while the rest of the elements, including turn indicators and pilots are surrounded by angled lines. The sides are covered with hard lines that give the small SUV an imposingly, albeit compressed, stubby stance along with the flared wheel arches. The tail-lamps sits vertically and looks triangular in shape while looking from the sides. It also has horizontal creases which extend into the car’s profile. To have more space in the rear and to look like a solid SUV, the spare wheel is mounted on the hard shell tailgate and adds to its stance to be tougher. The wheels get new 10 spoke, 15 inch alloys wrapped with 215/75 R chunky looking CEAT Czar H/T tyres that provide more grip to the vehicle. The overall look of the TUV300 is the strongest point and attracts customers who is looking for a contemplating design. 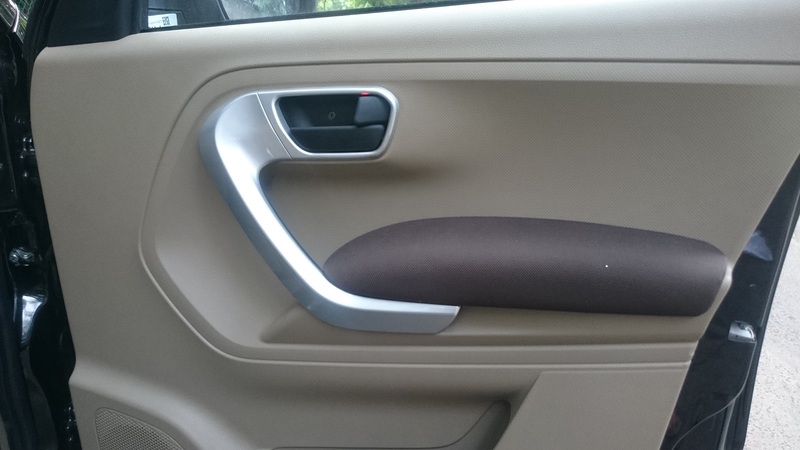 Once boarded the car, a big surprise comes in terms of quality of the trims and features. Mahindra has worked with Italy’s Pinninfarina design studio for the contemplating design. The 2-tone black-beige dashboard is neatly laid with the hard materials and use of silver finished plastic bits around the cabin looks well thought out and classy. The instrument cluster is informative and looks great too, but doesn’t come with the touch screen. In terms of space, TUV300 is also surprisingly spacious when it comes to headroom, shoulder room and legroom. The front seats are comfortable for short distance but bit too firm and not comfortable for long distance. 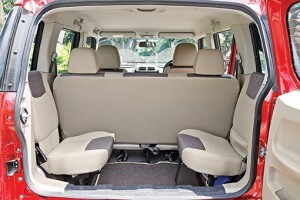 The rear bench seats too offer good space for 3 passengers and have enough legroom but lack in thigh support. The last row is practically meant for children but for short distance even 2 adults can be accommodated. Folded, the jump seats reveal a boot space of 384 litres, which can be expanded to 720 litres upon folding the non-split second row seats. Its notable that the folding facility for the second row seats is available only for the top line T8 variant. While looking at the equipment list, the range topping T8 variant comes loaded with goodies such as reverse parking sensors, static bending headlamps, driver information system, voice messaging system, powered mirrors, steering mounted controls, rear defogger, lumbar support for front seats, follow me home headlamps, dual front airbags, ABS with EBD, immobilizer, auto door lock with driving and anti theft warning. The car maker has also made good effort to keep NVH levels low inside the cabin, whilst there would be very little grunt from the engine seeping into the cabin. Powering the TUV300 is the mHawk80. The 1493cc motor puts out 82.5bhp and 230Nm of grunt with the help of twin-stage turbos. In city the engine performance is brilliant as the steering is light and has a decent amount of torque available lower down in the rev band. The absence of dead pedal is little bit inconvenience, as the customers now look for comfortable driving both in city as well as in highways. In the highways if you press the accelerator hard, the motor sounds very stressed and runs out of breath. The five-speed manual gearbox has to be used in such a way to get the triple digit speeds. Once the engine settles in a certain speed it shows off some good aptitude in the ride and handling department due to the presence of anti-roll bars and the third-gen Scorpio derived chassis. Overall, TUV300 drives very well, offers excellent control and good ride comfort. As mentioned earlier the small SUV is built on the shortened version of Mahindra’s new ladder-on-frame platform, which was introduced in the new Scorpio by Magna International. The chassis is reworked from the Scorpio, shortened to take advantage of the sub 4-metre duty benefits, yet it’s sufficiently rigid and is capable of loading 7 passengers. The chassis architecture has independent double wishbone suspension at the front, and a non-independent, multi-link, coil-spring setup at the rear. Interestingly its 190mm ground clearance is 10mm more than the Scorpio’s, and the generous 2,680mm wheelbase is identical. The sub 4-metre SUV, a few millimetres shorter in length (3995mm) than the Ford Ecosport but taller (1839mm) and wider (1835mm) substantially. and has the best-ever interiors of any Mahindra car till date, thanks to the good plastics, appealing trim and great features. Surprisingly TUV300 also comes with the automated manual transmission (AMT) which has been co-developed with Ricardo. 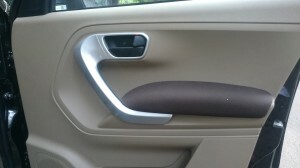 The AMT version should help Mahindra to attract more customers who look for SUV, which has 7 seater option as well. 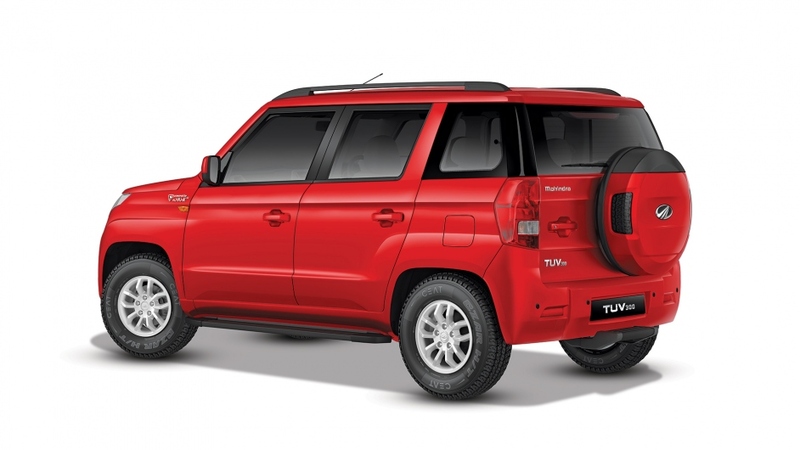 Overall, TUV300, a well refined vehicle from Mahindra which will be a tough competitor to its own siblings.